Are you worried that your posts are being shadowbanned on Instagram? You may notice a dropping follower count or that you have less engagement on your posts than expected. If you’ve searched for a hashtag you know you’ve used, you may be unable to find your post. So what’s going on? These are all signs of an Instagram Shadowban. You may have heard the term ‘Shadowban’ used before on other popular social media sites, such as Twitter and Reddit. Although the exact definition of shadow banning varies between the different platforms, a shadow ban restricts the amount of people who can see your posts. 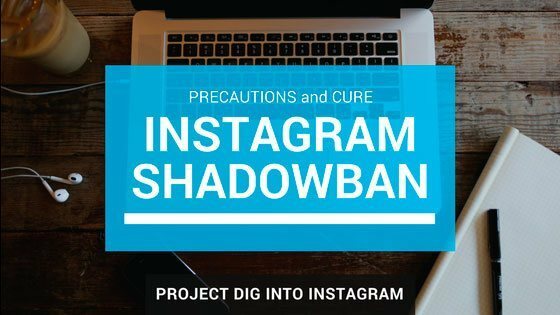 While Instagram has not directly confirmed the existence of shadowbans on their site, they did indirectly address users’ concerns regarding the issue. As you can see in this announcement, Instagram has not directly admitted to applying shadow bans to users or posts. However, they do confirm that there are problems with their hashtag search function – which can be assumed is a symptom of shadow banning. The general consensus about how Instagram shadowbanning works is that it hides your posts from users who are not currently following you. This obviously is hugely detrimental when trying to grow your account. How Do I Know if I’m Shadowbanned? The best way to determine if you have been shadow banned is to attempt to search for your posts using a different Instagram account that does not follow the account in question. If you’re able to see your post (either under Top Posts or Recent), then this post and your account most likely are not shadowbanned. However, if you cannot find this post, it is likely that your account is shadowbanned. Why is this happening to me and what can I do? If you’re trying to use a bot by yourself to grow your account, this is likely the cause of your shadowban. Instagram can detect bot activity because they have imposed “limits” on accounts. Everyone’s daily limit is different and is determined by several variables. When you use an unmanaged bot, you will be likely to exceed these daily/hourly limits. There are managed Instagram growth service on the market that apply bots to your account, but in a managed way that won’t exceed limits. XPLODSocial is the leading example of a safe, effective, and affordable full-suite managed growth service. By using a service like this, you can experience all the benefits of a bot without the drawbacks of exceeding your limits and being shadowbanned. Repeating hashtags can seem appealing, since once you’ve found an effective 30 hashtags to use, you can simply save these in your notes to later copy and paste. However, if you repeatedly use the same hashtags, particularly within a 24 hour period, Instagram may determine that your account posts spam and apply a shadowban to your account. Find 60 or more effective hashtags to use and cycle through these, using different hashtags for at least every other post. By doing this, your account will appear less suspicious to Instagram and will be more likely to avoid a shadow ban. There are some hashtags on Instagram that are banned outright or are limited in some way due to inappropriate content. If enough users misuse and abuse a hashtag, it can be banned, even if it seems completely innocent. For example, in 2016, the hashtag #Kansas was banned due to an influx of inappropriate content with this tag. If you use a restricted hashtag on your post, the entire post may become shadow banned. Before you use a hashtag on your post, search for this hashtag on the explore page first to determine if it is restricted in any way. A banned hashtag will not produce any search results, and a restricted hashtag will produce a limited number of posts along with a disclaimer. Avoid using any hashtags that have been restricted and recheck hashtags periodically to ensure that they’re still valid. You may receive a shadowban if you’ve posted offensive or inappropriate content that goes against Instagram’s terms of service. Instagram is notified about the nature of your content through reports issued by other users. While it’s impossible to control the actions of other users, we can limit the potential that they’ll report your content. The simplest solution to this problem would be to familiarize yourself with Instagram’s terms of service and ensure that your content adheres to these guidelines. Some users who claimed to have experienced a shadowban reported that staying off of Instagram entirely for 2-3 days helped lift their ban. If you believe you’ve received a shadowban by mistake, you can try to reach out to Instagram’s support, although they may not respond or be able to assist you. You can “Report a Problem” in the settings of the Instagram app or reach out to customer support at their official email: support@instagram.com.